Cardgrrl's house is now finished and she has moved in. Last night I was over there for dinner and recreation. I taught her how to play OFC poker. I've only played once before for money, though a few days ago I bought an app for my Android phone and have been playing some no-money games with friends around the country. So my experience with the game is not quite zero, but pretty close to it. Which means that situations I haven't seen or thought of are going to come up from time to time. Cardgrrl had fouled her hand, so I potentially had a big score here--a scoop plus a royalty for the full house. But neither of us knew whether this hand was valid or fouled because both the top and middle had J-10-7. And it's not like Cardgrrl has a few Chinese Poker rule books sitting around the house that we could consult. So I posted the picture on Twitter and asked for opinions from those with more experience playing. I was surprised but pleased that the answers I got were unanimous: It's a valid hand. (A) Jack of spades is a higher card than jack of hearts? (B) The two hands are considered equal, and being equal is valid? 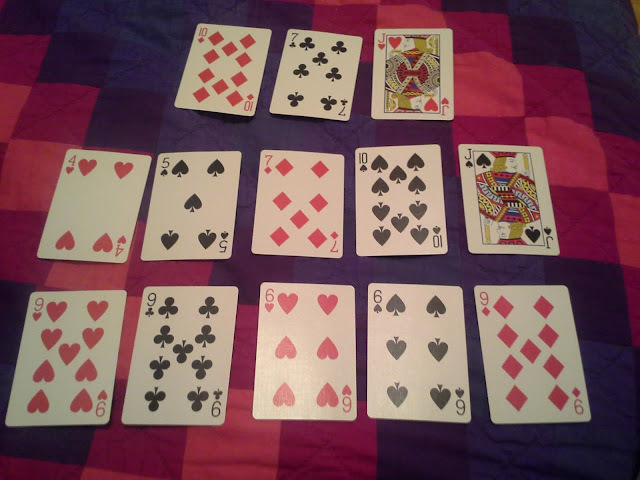 (C) The middle hand is J-10-7-5-4, which is better than just J-10-7 on top? Here Twitter delivered some variability in the explanation, with all three possible rationales getting at least one nod. But the answers from the most experienced players were consistently (B). Apparently two hands tying is as valid as the stronger one being below the weaker one. So, for instance, if you happen to make a seven-high straight on both the back and the middle, that's a legitimate hand, not fouled. To put it another way, I had been under the impression that each hand must be stronger than the one above it, but the actual rule is that no hand can be stronger than the one below it--which is not quite the same thing. Well, on Saturday Cardgrrl also cured her catlessness. 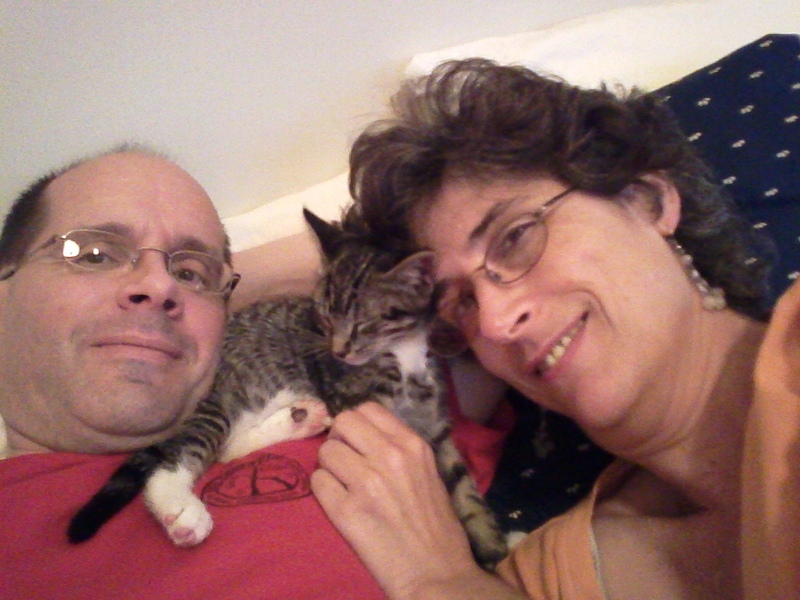 She went to one of the local animal shelters and brought home a tiny bundle of feline furriness named Loki. He is, as she accurately puts it, ALL OF THE CUTENESS ALL OF THE TIME. My guess is that if you did a chemical analysis of him, he would turn out to be 99% cuteness and 1% carbon/nitrogen/oxygen. See more of Loki's sweetness here. Survey question: How adorable are we?